Multi-award winning actress Rebecca Hall (Iron Man 3, The Prestige, The Town) has landed a lead role in Adam Wingard's Godzilla vs. Kong. She's joined by Eiza Gonzalez (Baby Driver) in the epic battle between the two monstrous kings. Details on their characters are under wraps. Before she watches Godzilla and Kong go head-to-head, Hall will be seen in the comedic Sherlock Holmes take, Holmes & Watson, staring Will Ferrell and former Monsterverse star John C. Reilly. Meanwhile, Gonzalez will appear in the James Cameron produced Alita: Battle Angel. 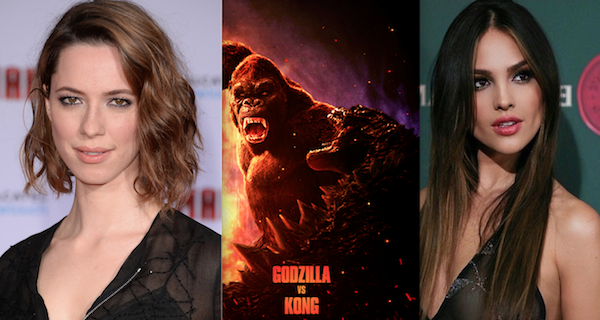 Godzilla vs. Kong stars Millie Bobby Brown (Stranger Things, Godzilla: King of the Monsters), Rebecca Hall (Iron Man 3, The Town), Julian Dennison (Deadpool 2), Brian Tyree Henry (Atlanta), Eiza Gonzalez (Baby Driver), Demian Bichir (The Nun, Alien: Covenant), Zhang Ziyi (Crouching Tiger, Hidden Dragon), Van Marten (Avengers: Infinity War) and Alexander Skarsgard (The Legend of Tarzan). The film is directed by Adam Wingard based on a writers room story led by Terry Rossio. Alex Garcia is producing.